The H.P. 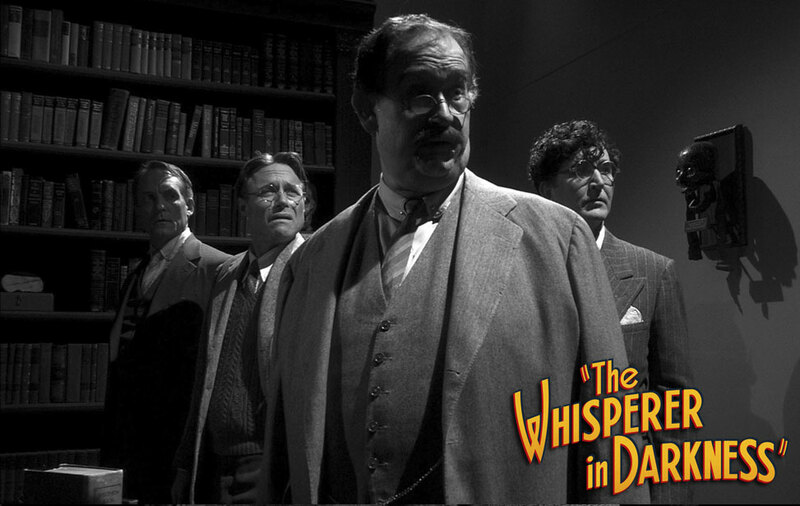 Lovecraft Historical Society presents its all new motion picture The Whisperer in Darkness. Folklore professor Albert Wilmarth investigates legends of strange creatures in the most remote hills of Vermont. 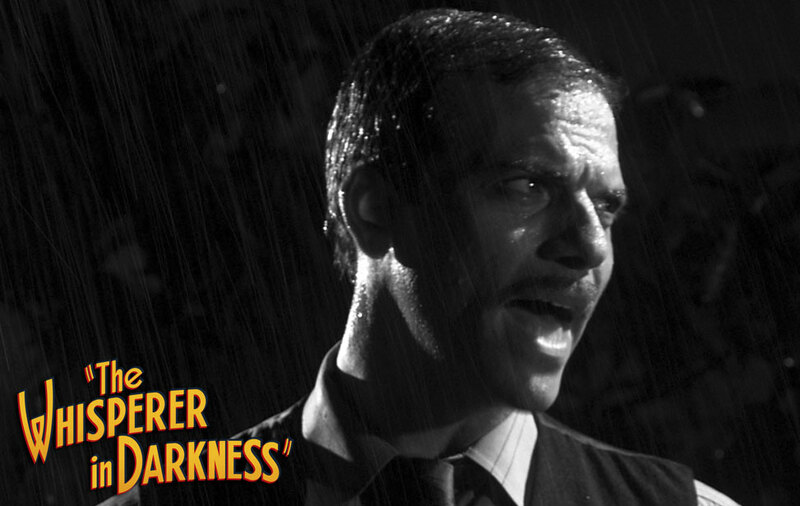 His inquiry reveals a terrifying glimpse of the truth that lurks behind the legends. H.P. Lovecraft's classic tale of suspense and alien horrors is brought to life in the style of the classic horror films of the 1930s like Dracula, Frankenstein and King Kong. Using the Mythoscope™ process — a mix of modern and vintage techniques — the HPLHS filmed on location in New England to create the most authentic and faithful screen adaptation of a Lovecraft story yet attempted. This award-winning motion picture has screened at festivals worldwide. You can now screen it from the comfort of your own home, as it's available on DVD and on BluRay disc. Below are samples of what some critics had to say about the film. [The Whisperer in Darkness] it’s the most compelling proof to date that there is a way to bring H.P. Lovecraft to cinematic life. 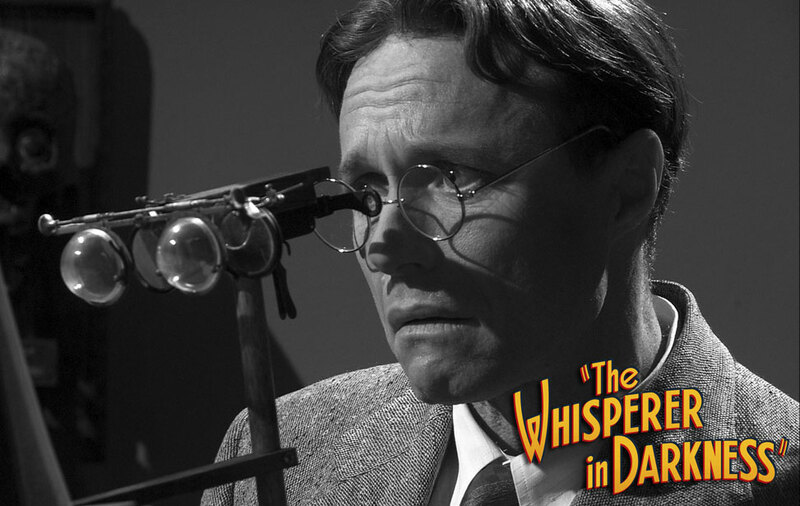 Whisperer pretends to be an artifact of the 1950s sci-fi/horror boom—it’s black and white, melodramatic, and the pacing is more of a long, slow burn than anything you’ve seen in the past year at the multiplex. But, man does it pay off; the needle on the creep-meter goes through the roof at certain climactic moments. It’s great fun. Ultimately, however, Branney nails the spirit of Lovecraft. 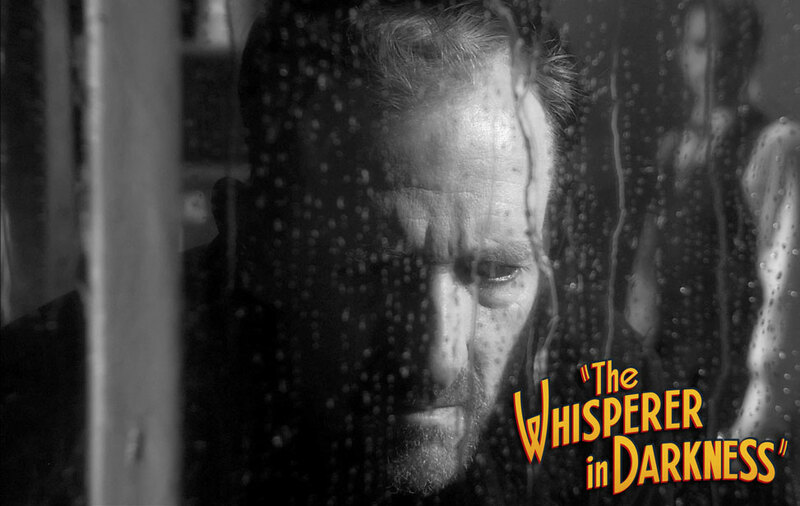 Through voice-over narratives and frightened faces, “The Whisperer in Darkness” conveys a sense of human sanity being unraveled by too much forbidden fruit. By film’s end, Foyer has the Thousand Yard Stare down to a science. His once-doubting Wilmarth has picked from the Tree of Knowledge, and become a reluctant believer. You are about to encounter what very well may be the single most successful H.P. Lovecraft adaptation ever to lick fear across a screen. Shot with an aesthetic, production design and performance style angled to emulate the feel of a '30s/'40s Universal horror film - without falling into camp - WHISPERER arrives like shadows out of time, a discovered relic from another dimension. A genuinely scary film and a hellishly great time. Those looking for Lovecraft done right should look no further than Sean Branney’s THE WHISPERER IN DARKNESS. I’ve read the story quite a few times, and though this story of otherworldly portals and demon bugs from other dimensions is not the most literal of Lovecraft’s work, I still don’t think that it’s been adapted perfectly. Until now. The filmmakers seem to not only possess the uncanny ability to translate Lovecraft’s words and themes with ease, but they also punch up the story with modern effects while giving it a timeless quality of the matinee serials. Though this film is heavy on the talk, the strong performances and full embrace of the monster movies of the fifties make every second of this film intriguing and unblinkable. 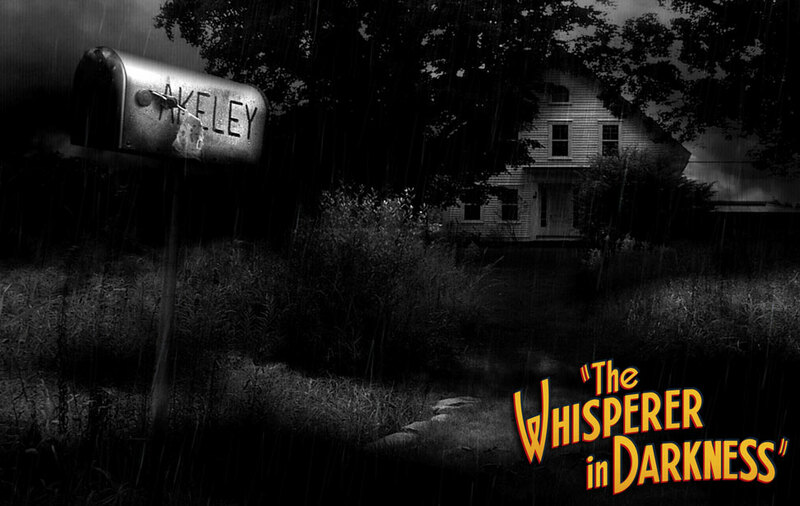 Filmed in stark blacks, faded whites, and amorphous greys, THE WHISPERER IN DARKNESS is a monster movie for folks who miss going to monster movie matinees. Branney adapts this tale of science proved wrong sharply with quick line exchanges and every eerie trick in the book made to amp up the old timey thrills. THE WHISPERER IN DARKNESS is the best adaptation that I have ever seen of an H.P. Lovecraft tale! The H.P. Lovecraft Historical Society has put together a very worthy 2-Disc Special Edition that covers all the bases, and then some. Disc 1 is where you’ll find the movie, Chapters selection, and a plethora of Subtitles to choose from (Catalan, Croatian Czech, Danish, Dutch, English, Romanian, Spanish, Italian, Japanese, Norwegian, Polish, Portuguese (PT), Portuguese (BR), Swedish, Euseka, Finish, French, German, Greek, Hungarian, Russian and Turkish). Disc 2 is comprised of the “Making-Of” Featurettes, Extended/Deleted Scenes and Trailers; all of which can be accessed on the main menu. The Whisperer in Darkness is a hell of a fine film, one of the best adaptations of a Lovecraft story ever made, and it’s far superior to the vast majority of bigger-budgeted films that have “H.P. Lovecraft’s” before their titles. Whisperer is faithful to a fault to the source material. What changes it does make are very welcome and actually enhance the story, as opposed to just padding things out, like so many other movies based on Lovecraft’s short stories do. It is an obvious labour of love and, when movie makers care this much, it shows in every frame of the film. If you’re a fan of H.P. Lovecraft, then this is mandatory viewing. If you’ve never read anything by HPL and always wanted to see what all the hoopla was about, this is a great place to start to get a handle on his unique and genre-changing brand of horror. Re-recording Mixer... Erin Michael Rettig, C.A.S. Legal... Sherry D. Spees, Esq. These people and organizations went above and beyond the call of duty in helping us make this movie. We thank them for their generosity and support. We know a great many people have been eagerly looking forward to the release of our next film since we debuted the trailer in October of 2007. You've clamored for the movie and for information about when it will be released. We've told you, "We're working on it". 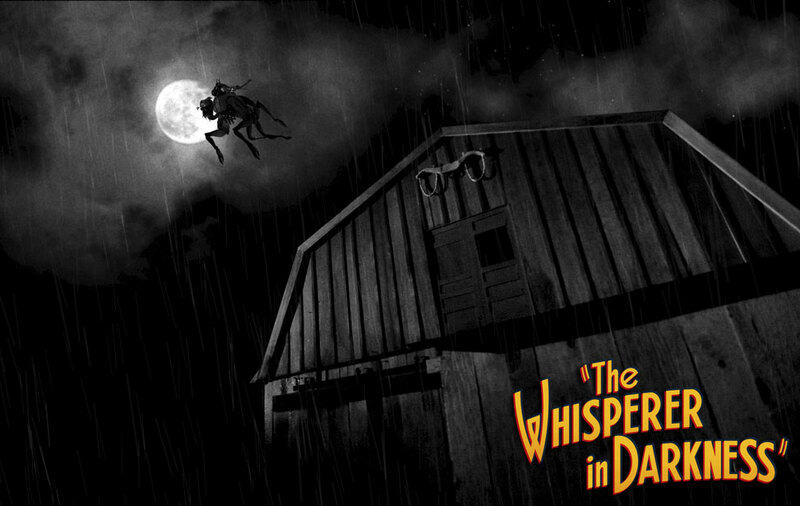 So now, at last, we're ready to tell you the strange and terrible tale of what's been going on with our movie of The Whisperer in Darkness. For starters, it's not really that strange nor terrible. 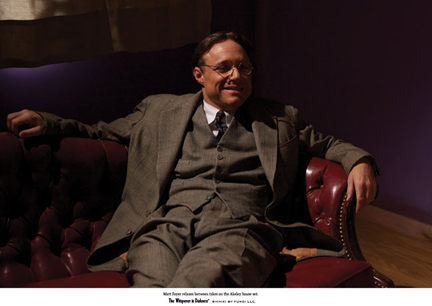 Shortly after we finished The Call of Cthulhu in late 2005, we settled on the notion of adapting HPL's "The Whisperer in Darkness" and shooting it as a feature length film, shot in the style of the early 1930s. This story -- with its strange whisperings and buzzings -- demanded sound, so we planned to shoot it as a talkie. But it would still be shot in Mythoscope® and would endeavor to capture the visual tone of the early Universal Pictures horror films like Dracula and Frankenstein. The plan was in place, all we needed was a script. So, one of us dove in on writing an adaptation, fleshing out Lovecraft's story, tweaking its structure and reshaping it into something that would be satisfying as a movie. In the meantime, the HPL Film Festival was approaching (this is back in 2007). Early that year, we promised our pal, Andrew Migliore -- the creator of the festival -- that we'd have something for him to show. We knew the scene where Wilmarth listens to the recording of the creatures would be in the movie, so it seemed like a good place to start filming a teaser. We gathered our friends Matt Foyer (The Man in The Call of Cthulhu) and David Robertson (our Cinematographer extraordinaire) and a few other helpful friends and we shot a teaser for the movie. It came out pretty good, so we gave it to Andrew to show at the festival and we put it online. We thought it would tide people over as we finished up the shooting script and got ready for production of the actual movie. If you've never written a feature-length screenplay, it's an arduous process, and it took the better part of a year to get the first draft completed. So the guy who wrote the screenplay gave it to the other guy to read, and he hated it. He didn't want to shoot the script. He decided what he needed to do was to write his own adaptation. So he took the better part of another year and wrote the script the way he wanted it to be. Then he gave his script to the first guy. The first guy didn't like the second script (see, we don't always agree on everything) and knew it wasn't the movie he wanted to make. So, the two fellows then sat down together to hash out a third version of the movie which was negotiated, reworked and jointly beaten into submission. And after a few months of this, and more than 20 full drafts, in April of this year HPLHS Executive Screenwriting Committee had a script they were both happy with. They tested it out with a group of actors and fellow filmmakers, made a couple of last minute changes, and in late April the shooting script was finalized. A screenplay is the blueprint for a movie, and once it was done, we knew exactly what would be needed in terms of locations, actors, props, special effects, etc... Things needed to be made, found, acquired, borrowed, designed, and rented. And that's what we're doing now. We've got 58 scenes being shot at 14 different physical locations, some in Los Angeles, some in New England. 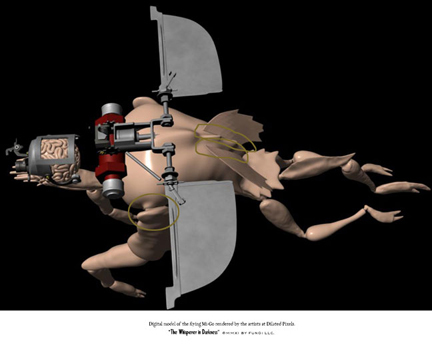 We're working on the designs of Wilmarth's costumes, Akeley's house, and Mi-Go's anatomy. We're lining up our crew, period vehicles, rain machines, and our hellishly bizarre list of props. Friends and artists around the world are working on the movie even now. We're on track to start actually shooting footage at the end of summer. By the end of September, all work with actors should be done and we'll move onto special effects and editing. We're not sure when the movie will be done, but hopefully sometime in this winter. We haven't told people much about what we're doing. We needed to hash out our internal differences on the story and come up with something that everyone at the HPLHS liked and stood behind. Now that we've got that, we're plunging forward with our typical reckless aplomb. We're still keeping lots of secrets from you as we're hoping to surprise you with some elements of the film. 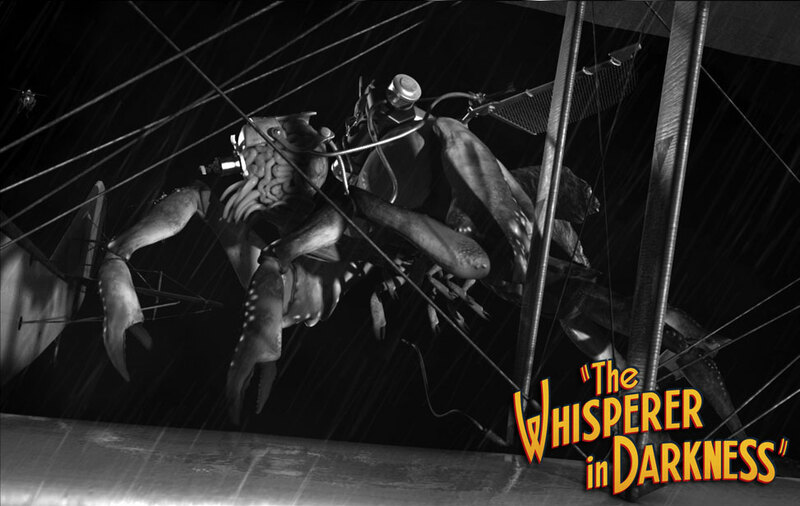 TWiD is a more liberal adaptation of the original story than The Call of Cthulhu was. 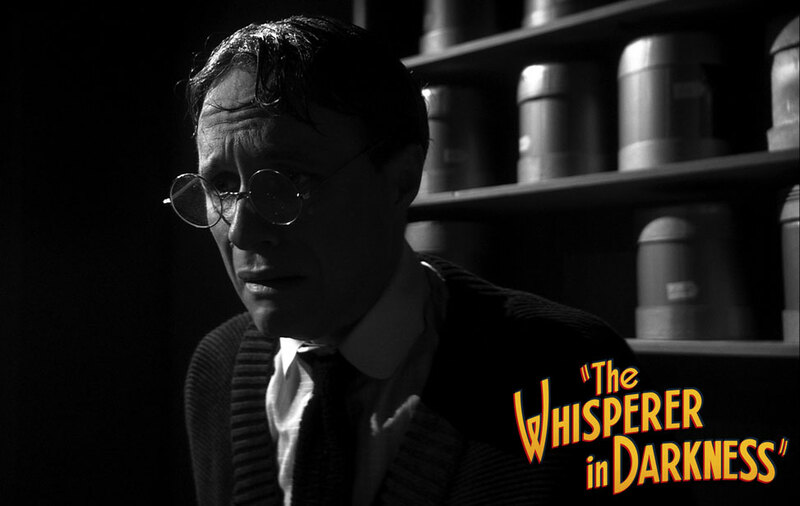 We needed to make the story longer to make it suitable for a film, and let's face it, unless there's some adaptation, "The Whisperer in Darkness" would largely be a movie about a college professor reading his mail. So, we have some surprises in store for you, but we hope you'll find them in keeping with the source material and our previous Lovecraft adaptations. So, it's getting serious now. The lawyers are involved. And the bankers. We went and got ourselves a Line Producer. And several boxes of guns. Making a movie is complicated, and for every cool thing you see onscreen, somewhere there is paperwork that describes it, secures permission to film it, releases it, etc... As we move closer and closer to principal photography, we have are dealing with more and more pieces of paper. We had to drag our lawyer into it all to make sure that we're doing everything right: protecting ourselves and the film from any legal issues which can be avoided. In order to keep the process of getting ready under control, we hired John Younger, a line producer. Basically his job is to really study the script and how we're planning to shoot the movie. He then figures out everything we'll need in order to do that, and from there he figures out a schedule. Once there's a schedule, we start figuring out how much everything will cost. Once we know what it will cost, then we start securing, making, fabricating, building, painting, borrowing, etc... the 10,000 things we will need to make Whisperer. It's John's job to keep us in line and let us know when we're spending too much time or money. He says, "No, you can't have Cthulhu leaping out of the sea to take down the zeppelin". He knows the zeppelin is borrowed from the National Museum of Lithuania and must be returned in pristine shape for us to get our deposit back. Now that the legal and financial aspects are coming into focus, we're about to hire on some of the rest of the crew. Those of you who have seen the Call of Cthulhu special features may recognize some faces. And there's plenty of new faces too. Our quest for props continues to grow and we're making friends with lots of people who sell items from the 1930s on eBay. So boxes filled with strange things regularly show up at HPLHS World Headquarters these days. Pre-production is boldly striding forward. We've hired our second member of the production team. 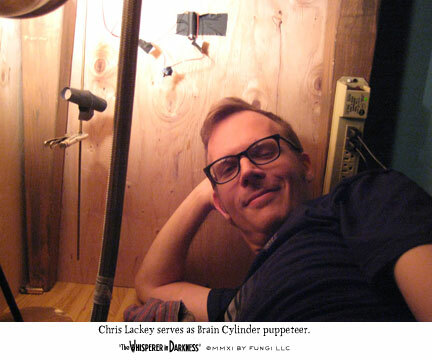 Chris Lackey (whom those of you who have seen the Special Features on The Call of Cthulhu DVD may remember as the guy who fell through the non-euclidean angle into the pit with the cougar) has joined our team once again. He's working with our own Andrew Leman on the very long list of strange and complicated items which need to be created for the production. There's brain cylinders, the black stone of the Mi-Go and things we dare not even tell you about, and our Art Department is hard at work trying to ensure they're all made in time for the cameras to start rolling. We've pulled in extra assistance for a few special items from craftsmen in various corners of the world to help us out with some specialty items. The things they are making look great and it's nice to have the HPLHS studio once again littered with alien technologies and body parts. Well, we often have that kind of stuff around our studio, but there's even more of it now. We've continued to flesh out the production team. 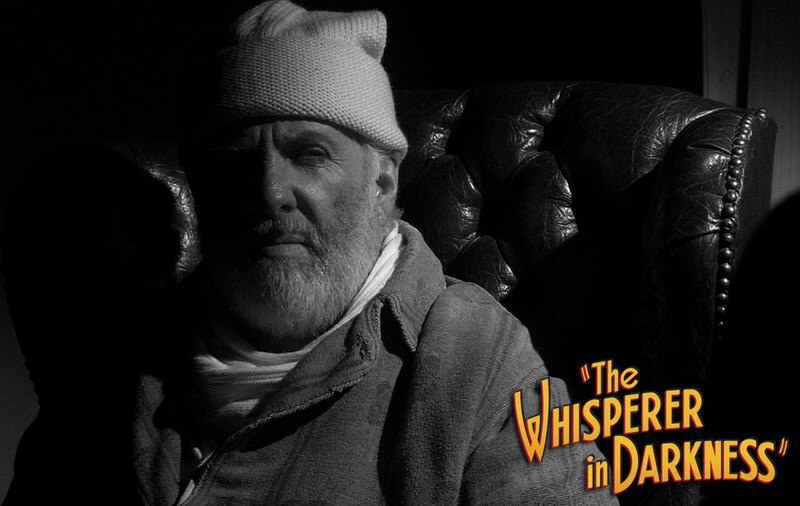 David Robertson, our Director of Photography for The Call of Cthulhu is back and will be providing his keen eye for shooting in black and white to Whisperer. We'll be shooting in HiDef on the Sony F900 camera. It's the same camera we used for shooting the Whisperer teaser. The most recent Star Wars films were shot on the same camera. We've also managed to talk Troy Sterling Nies into joining the Whisperer team. He'll be on-set capturing production sound and then he'll switch to composer mode, creating another lush period symphonic score. We're busy wrangling many more members to join our crew. We'll start shooting in New England September 22nd. We'll be there a little less than a week and then we return to Los Angeles and shoot through October 17. At that point, we'll be all done with actors and full-sized sets. 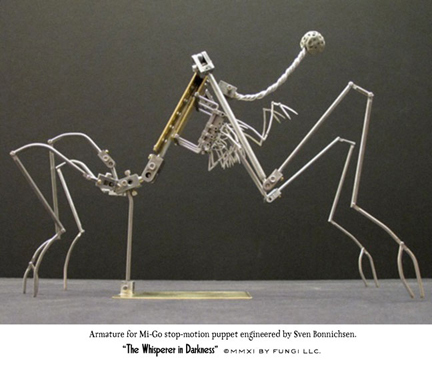 We'll move on to work with our Miniatures Unit and will film miniature and stop motion sequences through the fall. We'll start editing the movie at this point too, and hopefully sometime around the end of the year we'll have a rough cut of the movie. Then we move into adding music, some special effects and putting polish on it. If all goes well, we'll have Whisperer done in early 2010. The movie is now cast. The core cast of Whisperer features 19 actors. In the end, well over 5,000 actors submitted for roles. We sifted through all the submissions and called in roughly 100 actors to meet us in person and read from the script. Out of that group of actors, we chose the most experienced and those best suited to the roles. HPLHS fans may recognize a few faces, though there's plenty of new actors on board for the production. Veteran film, TV and stage actor Barry Lynch will be playing the role of Henry Akeley. Barry's no stranger to HPLHS projects, having performed in The Call of Cthulhu and several episodes of Dark Adventure Radio Theatre. 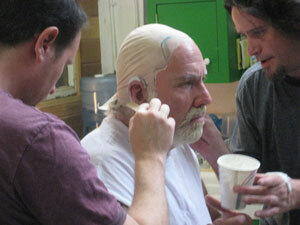 Special effects in the movie required that we make a life cast of Barry's head. 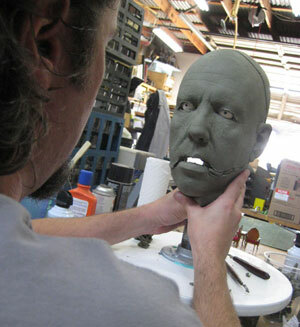 Our special effects makeup artist, Dave Snyder, did a full cast of his head and teeth. Dave is a highly experienced professional makeup artist whose work includes (among other things) many of the corpses from HBO's Six Feet Under. 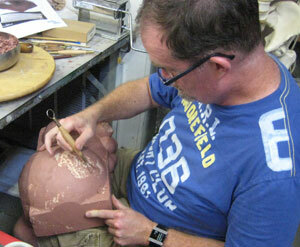 From the life cast, Dave then makes a separate positive version of Barry's face which he then sculpts. After he sculpts it... well, we wont tell you exactly what we're up to, but we'll have a version of Henry Akeley that'll look really great and can do things that even Barry Lynch cannot do. And while the makeup team is toiling away, other teams are hard at work too. We have a scenic designer drawing up the floorplans for the sets. We have our costume designer figuring out what all these people will wear. We have our in-house prop team making all kinds of weird stuff. We have talented friends near and far contributing additional props and artwork to help get everything ready. Leman and Lackey are toiling around the clock, inventing new ways to make things that mankind should not make. The things they are making or so secret, we dare not depict them here. At this point, there are nearly 50 people working on various aspects of the film. In late August Sean and David Robertson completed the final scouting trip to New England. We looked at all the locations where we'll be shooting, met with everyone we needed to meet, and generally did our best to ensure that everything's ready on the New England side of things when we arrive. We were once again hosted by Mat & Susan Jacobson, who receive the highest HPLHS praise for their hospitality. Mat also earned our admiration for his uncanny ability to remember rural dirt roads which he visited with Sean and Andrew two years ago. Overall, we were delighted by how friendly and cooperative everyone we met was. We would come up to people and ask if we could film their house. Most people said, "Sure! Would you like to film our barn too?". This is a pleasant change from filming in Los Angeles where such requests are often met by a crusty look, thousands of dollars in location fees, and a demand for a multi-million dollar insurance policy. People were nice to us. We were glad to be there. We're renting to houses to accommodate our cast and crew, and both are situated on lovely properties brimming with rural New England scenery. One of our key locations is Miskatonic University. We've found a lovely and cooperative New England college where we'll be filming. We think it's got the Miskatonic vibe and its period architecture will look great on-camera. Most of our other New England locations are outdoors, several of which are the actual locations Lovecraft describes in the story. While it's expensive for us to haul all our gear and crew back east, we think it's well worth it to be able to shoot in the legend haunted mountains of Vermont and among the ivy-clad walls of a prestigious New England college. And while Sean and Dave were traipsing around New England, Andrew, Chris and others were toiling away 100+ degree heat as fires raged not far from our studio. The prop list is daunting for Whisperer and Chris and Andrew continue to work like maniacs to get everything done before the gear truck departs for New England in the middle of September. We've commissioned certain props from several specialists around the globe, and all are hard at work to ensure we make the deadline. The cast is now fully in place and our Costume Designer, Jessica Dalager, is working on getting everyone fitted. 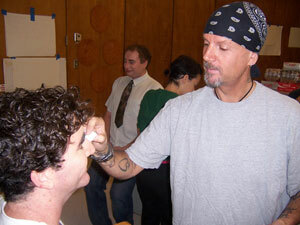 Our makeup artist, Glenn Alfonso, is studying everyone's faces and cutting hair as needed. Andrew Hildner is drafting construction drawings for the Akeley house set - the most complicated of the sets which will be built for the production. Line Producer, John Younger, is working on logistics for vehicles and rented equipment, all while relocating his home from Tennessee to Los Angeles. Sound man, Troy Sterling Nies, is preparing to drive from North Dakota to LA, where he will get out of his car and get into our gear truck and drive it to New England with Production Assistant Amanda Deibert. 1 October 2009 - Location! OK, we're back from our adventure to New England. In the end, 17 of us made the trip to shoot footage in Massachussetts, Vermont and New Hampshire. Over the course of six days, we shot at numerous outdoor locations to take advantage of access the story's real locations. Where we're not on the story's actual locations, we found first-rate local substitutes. Our hearty cast and crew endured long hours, long car rides, long shoots, and fleeting moments of sleep to capture the exterior footage we shot for Whisperer. We thank them for their suffering. We hope you will too. 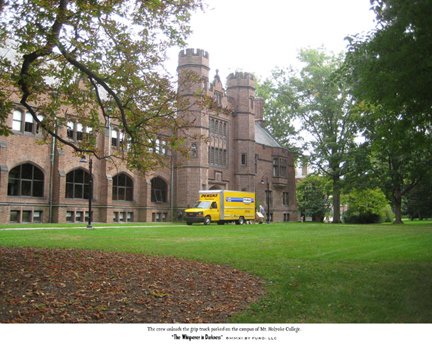 As foretold, we shot at Mount Holyoke College in South Hadley, Mass. We thought the college would prove an excellent casting choice for Miskatonic and being there proved us right. We grabbed some great establishing shots of the campus and then shot a scene outside a ladies' dormitory, under the watchful eye of the dorm's residents and a drizzle of rain. We returned later in the week to shoot Miskatonic's main gates and an interior scene in one of the campus' beautifully appointed vintage classrooms. A couple of the New England shots required background players. We put out the call through various channels and were delighted to find terrific people who heeded our call. 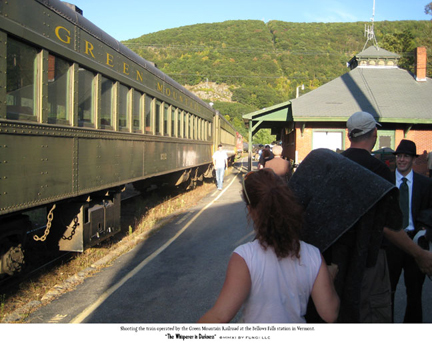 We shot with background players at Mount Holyoke College and at the Bellows Falls, VT train station. A group of talented and enthusiastic folks dressed up, turned up and played a great role in the film. Shooting in New England also involved plenty of work out in the field. And by that, we mean in the rivers, in the woods, and quite literally in the fields. Local folks told us plenty about the wet summer they'd had and how we should expect rain everywhere we went, but in the end we had to resort to making our own rain most of the time. In case any of you have forgotten, our crew can quickly point out that a barrel of water is very heavy. Many cast and crew members will also point out that the temperature of our our artificial rain water was unnaturally cold, especially if you've been drenched in it all night long. And after we're done, the rain rig has to be put away, the actors dried, the costumes packed up and a few scant hours later we have to pull up to the next location. Most of the crew got back very late on Sunday. 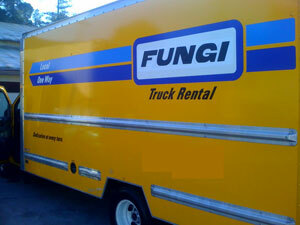 Our intrepid road warriors, Troy and Amanda, drove the FungiMobile back across the nation, logging over six thousand miles. We're now set up in Los Angeles, where most of us live, and filming began here today. We shot two indoor scenes today. After the wilds of New England we were able to set up shop in our rented "sound" studio in Los Angeles. Our schedule has us filming three weeks in Los Angeles before we complete the portion of the film involving actors. Of that three weeks, two days were on locations in Pasadena, but the rest of it was slated to take place in the studio. As of now, we're in the middle of the second week and are bracing ourselves for a final push to the principal photography finish line. Our very first day of shooting in LA involved a group of background players. These stalwart volunteers came down to the set and met up with our lovely and talented cast members and we shot our first scenes in the studio. All was well, although a very vocal cricket decided to cast itself as an extra. Fortunately our background team seemed to have a knack for frightening it into silence as we shot our takes on the set. We had an even bigger herd of background players join us for a shoot at Pasadena City College, where we booked a period-appropriate lecture hall. Another group of lovely volunteers donned their period attire and joined us for a fairly long scene in which they got to be an audience attending an event at Miskatonic. They did a super job and spurred our actors on to terrific performances that we hope you will enjoy. After dealing with the challenges of recording sound on location in New England, we were rather looking forward to the relative ease of recording sound in our own sound stage. Apparently though, where we're shooting, the term sound stage is used to denote extra sound being added to our recording process. Between neighbors who sound like they're running some kind of blacksmith competition, a semi truck repair yard across the way and the fact that the studio sounds like it's on a flight path for the Burbank airport, our sound stage has been anything but quiet. 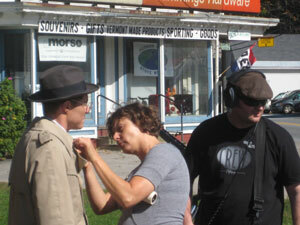 Still, we slog onward through the noise to capture every nuance of sound for our first talkie. In general, production has gone pretty smoothly for us. Naturally there have been a few minor incidents here and there, but generally, we've had nothing to complain about. Well, that was until we get back from New England. The plan was that our set crew would build out the numerous sets we'd be shooting on in the sound stage, including one particuarly complicated one which we would use for several days of filming. We returned to find that our very complicated set was about a third of the way done. It was over budget and our builders had to leave town. So, we sent them on their way, addressed the fundamental structural flaws in the plans made by our scenic architect and dispatched a new crew to make the place shootable. They've done a bang-up job for us and while we've had to reschedule the sequence of somethings, we're on target to shoot on the big set as intended. Unfortunately, a key prop for the show was also not completed on time. This week we find ourselves having to try and create an important and complicated prop at the last minute. We've rescheduled to buy as much time as we could, but in the end, some serious last-minute prop work will be required by the lovely and tireless (don't get me wrong here, they're tired) Art Dept. crew. This year we had to miss a favorite annual event: the HP Lovecraft Film Festival in Portland, Oregon. We were shooting and could not go. However, we were able to participate in a call-in discussion held at the festival where people in the audience could ask us questions about the production while we were actually on set shooting the movie. We were glad to be involved in the festival and appreciated the enthusiasm of the Lovecraft community for Whisperer. So, another chapter in the making of The Whisperer in Darkness is now complete. We have finished shooting in studio. Don't start bouncing up and down just yet though, we still have two sequences involving actors to shoot, plus plenty of miniatures, models and effects shots. We're not done by any stretch of the imagination. But we have surpassed another major milestone in finishing up our studio work. Shooting in the studio proved every bit as challenging as shooting on location. 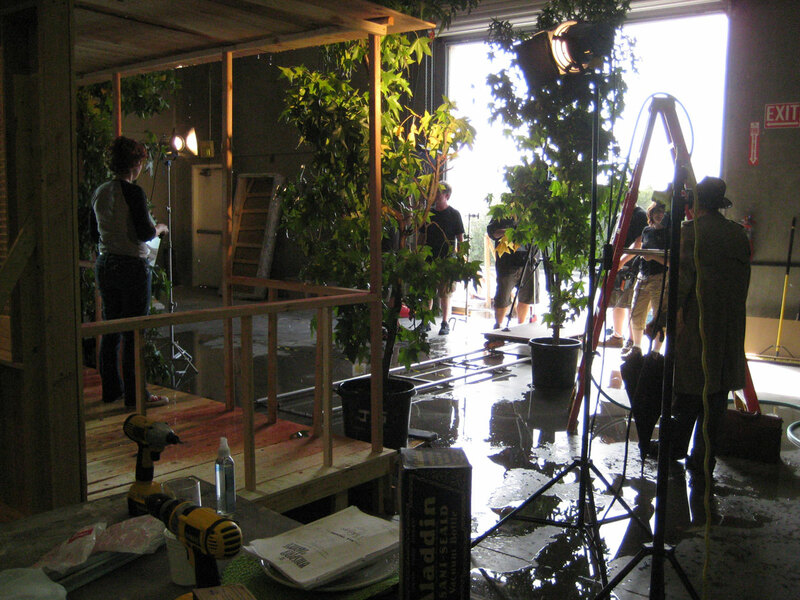 We had plenty of noise issues, but we also had the constant need to prep (design, build, paint, dress) every location in the studio, which meant wrangling plants, furniture, hay, rain (lots and lots of rain), animals, fog, actors and much more. Our stalwart crew was tough and resilient and we somehow managed to work our way through our most challenging difficulties and get the footage we needed. Hours were long, but no one cracked under the pressure. We did have to shuffle our schedule some, we did run hideously over budget to get things done in time, but we now find ourselves quite close to being done with principal photography. The screenplay is 94 pages long. Out of that, about six pages remain to be shot. So we are indeed getting there. We felt bad for our star, Matt Foyer, as we sprayed water at him for a week in New England. None of us - particularly not Matt - quite realized how much water would be flying indoors though as we returned to the studio. We setup our rain making equipment and day after day, it rained on Professor Wilmarth. Some days we dumped other things on his head too, but mostly it was lots of cold water. We really appreciate how tough Matt was in putting up with all of our precipitation. We also applaud many of the other performers in the film who endured extensive man-made precipitation. We really need to find the guys to wrote this and dunk them in a tank of very cold water. 5 March 2010 - No, Seriously, What Are You People Doing? In the middle of shooting the movie we also had to find a new home for the HPLHS. We very happily shared space with Nick Offerman at his wood shop here in Los Angeles ever since we built sets there for The Call of Cthulhu, but after a few years everyone realized that both operations had grown too big to continue to be roommates. At Nick's gentle suggestion we looked for a new place, and HPLHS took up residence in a former rivet factory a couple of miles down the road. It's taken us a while to get the new HPLHS world headquarters up and running and fully functional. But we've done that now and the HPLHS is better than ever. And we're driving forward with everyone's favorite mi-go movie. So, what's going on, you ask? The backbone of the project is now the rough cut of the movie. It shows us what we've got, what we don't have and what we need to work on. It shows us pretty clearly the things we need to do in order to get from where we are to completion of the movie. Sound is another key element that requires our attention. Our composer, Troy Sterling Nies, has his copy of the rough cut and he's batting around ideas for how to approach the picture in terms of music. In addition to the score, we also will need to do some audio work in terms of foley and looping. We have some scenes which we shot without sound for a variety of reasons. So now we need to go back and add footsteps and other sound effects to the soundless scenes. We also have a couple of scenes where the audio we captured isn't quite up to snuff. This happened most frequently in scenes in the rain where raindrops on the microphones wreak havoc with the audio. So, we'll bring the actors back in and have them try and match their original performances as we re-record a few bits of the film. Oh for the days when we were making silent movies....The last key missing ingredient is visual effects. In order to get these done, we have to look at the live action footage and use it as a template for shots where we'll integrate special effects, models or miniatures. Right now the big push is to get things ready for the live action shots in late March, but April will be all about miniatures and models. Fortunately, the new HPLHS studio space has room dedicated for exactly these purposes and we'll be able to build and shoot right here in our own digs. 28 March 2010 - And...Action! So we shot again this weekend. We wrangled some cast members, background players, crew, locations, gear, and vehicles and shot some of the scenes we still need coverage for. Friday was a fairly easy night of shooting elements for composite shots at the new HPLHS studio. Saturday was a little more involved, as we shot at night at an outdoor location in the Hollywood hills with several large vehicles and a total group of around 30 people. We had a good shoot and got some beautiful footage of key moments in the film. Our cast members continued to endure exterior rain shots and our background team were excellent sports about letting us dump water on them too. We were very pleased that the representative for Los Angeles County who was on set to supervise the shoot turned out to be a big Lovecraft fan and was really excited we were shooting Whisperer while on his watch. It looks like we'll still have two more days of shooting - one night of exteriors and one day of interiors - which we'll try to knock off in late April. Once we get those, we'll be done with shooting the cast and will be working on visual effects, sound effects, mixing, editing and the musical score. At this point, we're prepping for shooting this weekend what should be the final scenes involving cast members. We have a few setups we weren't able to get to due to time constraints on our March filming session. So, we'll be doing one night of exterior pickup shots and one night of interior pickup shots. Once we have those, Wilmarth and Walter Brown can retire their costumes as their shooting will be done. No more makeup, no more wardrobe. This will be our last chance to make it rain copiously on Matt Foyer. What else has been going on? Dave edited the footage we shot in March into the rough cut. We've started work on a few of the visual effects. Troy's started working on the score and we're cataloging all of the sound effects and foley work that will be needed, plus the few lines of dialogue that will need to be re-recorded for various reasons. 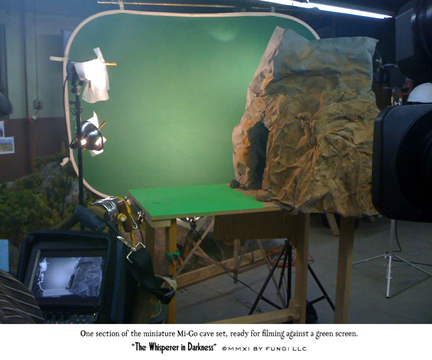 Completion of the live action shooting will allow Andrew to move forward with construction of some of the miniatures that will be incorporated into the picture. As suggested in the trailer, we're gunning for having the film complete by October. 20 June 2010 - What's up? Our miniature crew of Jason, Fred and Andrew have been working away building a variety of beautiful and small things which you'll see in various places throughout the film. 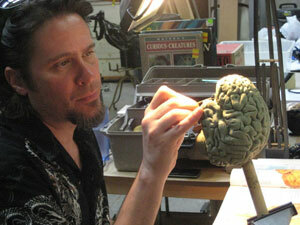 Super-sculptor Dave Snyder is back with us again, creating another very special scary prop. Troy had some serious computer hardware problems, but he's back up and running and composing away on the score. Sean's sound effect work is mostly done and he's adding some polish to the sound design (after all, our fungi need to sound just right). Speaking of fungi, we've added some team members who are working specifically on some of the more fungoid parts of the film. In the spirit of keeping surprises, we won't say much more on that topic now. Dan Novy has signed on to help us with a couple of small but very tricky visual effects shots. Dave's been polishing some of the visual effects and we're getting ready to make our last round of decisions about the edit of the picture. So, you see, we have been hard at work and expect to remain so throughout the summer. But we are getting closer to being done and are happy with the progress we're making. Yesterday we decided to try out a new camera and lens provided to us by the fine folks at Moviola (the Hollywood production equipment company from which we rent things like our camera, lenses, jibs, etc...). We were shooting some of our miniatures and the small form factor and excellent lenses of this new camera seemed like a perfect fit. But alas, our experiments yielded images which showed that our miniatures were going to work well, but this camera would not. Its image fidelity was not good enough, particularly when cut in with the existing footage from our beloved Sony F900. So, we'll toss this test footage, rent the Sony again, and re-shoot the miniatures. We knew this would be an experiment and we were glad to discover this solution was not the right one for us after only a few hours of shooting. One of the interesting developments in making this movie is that we started running low on funds. Several aspects of production went horrifically over budget, but we were able to limp by for a while. But making it to the end of production was looking like it would be difficult without the infusion of more capital. To our tremendous delight and gratitude, Sandy Petersen decided to put up some capital to help us finish the picture. We were thrilled to get an investment of funds, but we were especially thrilled that they should come from a person of key import in the modern day Cthulhu Mythos and someone whose work proved to be a big inspiration to the HPLHS. For those of you who don't know, Sandy was the original author of Chaosium's role playing game Call of Cthulhu® some 25 years ago. It was through playing that most execellent game that we eventually found ourselves staging Cthulhu Lives! games which in turn gave birth to the HPLHS. So, if you see Sandy, thank him for his key role in helping to complete Whisperer. See, we told you we'd be better about web updates. At the moment, one of our priorities is to lock down the edit. Troy is trying to compose a score to match the picture, and if we add a few seconds here, take out a few seconds there, and move this scene over here, it makes his life a nightmare. So, we watched the movie last week, hoping to make a few final determinations about how some scenes will be cut. We're evaluating options, negotiating and filibustering, but we should have the picture's edit locked down within a week or so. We don't actually watch the movie in sequence very often - instead we're usually working on a scene on sequence at a time. Everyone took notes (including line producer, John Younger - welcome back, John), about the current edit and things that still need attention. There's plenty of those. Among the miniatures being built by Andrew and our modelers is the Round Mountain miniature. 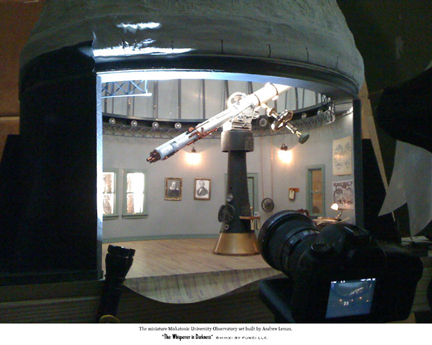 In one sense, it is the smallest miniature being built for the movie, at roughly 1:30 scale. But in terms of actual size, it's pretty damned big (roughly 12x16 feet). 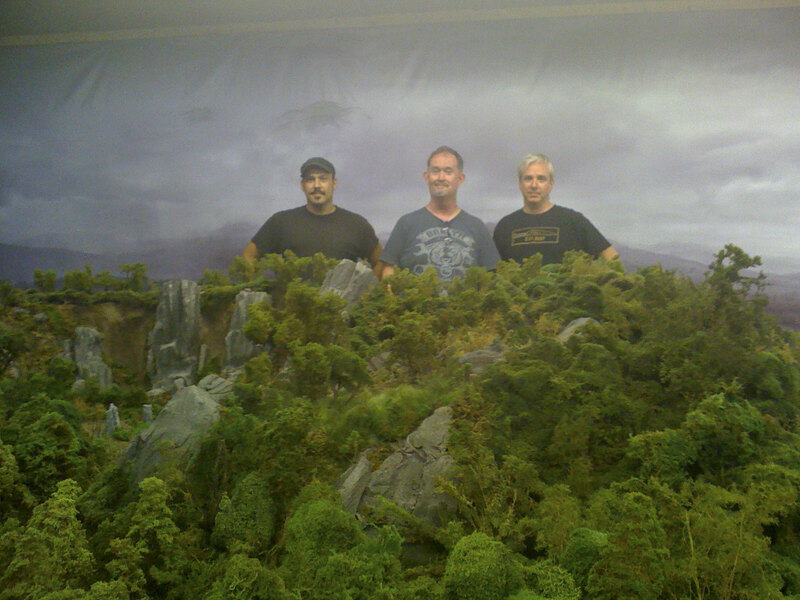 It features thousands of tiny handmade trees, individually placed by Fred Manchento, Jason Voss, and Andrew. Surviving fragments of the miniature are now at the Main Street Museum in White River Junction, Vermont. There's many other miniatures, not the least of which is Andrew's barn. 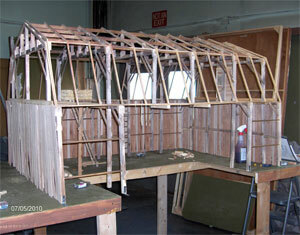 It is a scale replica of an actual barn at a property where we shot footage in southern New Hampshire. The outside of the barn had to be built to match footage of the existing property, but the inside of the barn was built to so that we could photograph it from within. What you see in the photo is the barn before it was finished, but it now has a nice roof and cupola, and on the inside there's ladders and scale hay bales. We continue to move forward on all aspects of production. While Andrew and Fred and Jason continue to build miniatures in anticipation of the last round of shooting, Dave and Sean are concentrating on other kinds of visual effects and details, adding sound effects, compositing some miniatures into live-action plates, and basically hand-tweaking virtually every frame of the movie. Wow, what a month it's been here at HPLHS World Headquarters. We shot again on August 27 and 28 and finally wrapped all photography on the film. No more cameras, no more lights. No more renting a deck to digitize footage. Farewell to the jib and the kinos. This round of photography was all about miniatures. We shot the Round Mountain miniature and returned to a few other setups where the footage we shot the first time around wasn't quite perfect. But this time around we got the footage we were after and were finally able to put the camera away for good. So why aren't we done, you ask? The new footage had to be captured and cut into the picture. We also have some very special special effects shots which are being done by some of our colleagues. 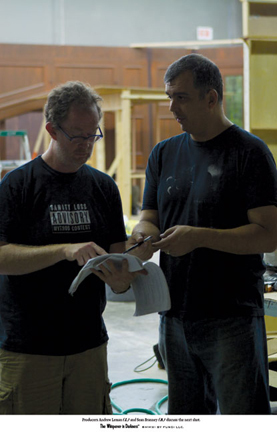 They're not quite done with their work yet, and the movie wouldn't be complete without it. But as they finish up each shot, they send it to us and we cut it on. These effects shots are looking great and we'll be able to tell you more about them soon. So we're finishing off the last work we have on the visuals, doing a preliminary audio mix. When that's done, we'll test the movie on a few close friends, see what they have to say, make any last minute changes, and then burn a couple of DVD screeners. We're under deadlines to send the first screeners of the film off to some film festivals in late September. The version of the movie we send them wont be in its final state, but hopefully it'll be in good enough shape to warrant the possible inclusion of Whisperer in these important film festivals. The version of the movie we'll send on these screeners won't have our final score (it's still in the process of being composed) and the audio won't be mixed. We may continue to polish the visuals this fall until they are just right. But the movie will be pretty darned done. Post. That's where we are. We're adding chunks of music as Troy finishes them and sends them to us. He's forecasting completing the score in late November and that gives us then December to make final adjustments and to have the full professional audio mix of the movie done. Then we'll be ready to show it to someone. Once we get a final version of the film completed, we'll finally have a screening for the cast and crew - virtually no one from the production has seen the current version of the film. We've submitted a cut of the movie to about half a dozen film festivals. We made a screener with a temporary score made mostly from music Troy composed for us on other projects. We send it off to them and then wait and hope for the best. We should start to hear back from the first of them in December. The glamours bits of filmmaking with lights and actors are well behind us now. At this point it our work is divided into two main categories: work to complete the movie itself and work on the movie's future. In terms of the picture, we've been tidying up a few details - and we added one additional rotoscoped shot. We looked at the picture again and tried an alternative edit in two scenes which we were all happy with. It cut about a minute out of the film, but we think it's the better for the trim. Just before Thanksgiving we finally locked the picture's timing. That means we will not add any extra time in nor take any out. This is important as Troy is scoring the movie and it's a real headache for him when he writes a sequence of music to match the picture then we suddenly make the picture longer or shorter. Speaking of Troy, he's about 90% done with composition and we've been delighted with what he's done. We've engaged the services of Erin Rettig as our Re-Recording Mixer. He'll be blending all of the audio, setting the volumes of the many tracks of sound and then outputting it for 5.1 surround and stereo mixes. His work should be done around the end of the year. And when he's done, the movie's done. OK, folks, we're getting pretty close. Completion of Whisperer is now scheduled for February 16. Woohoo! We're closer than ever to figuring out how the movie will be distributed and are doing our utmost to help make it so as many of you as possible will be able to see it before long. We've talked here some about the process of mixing. Last night we met with our Production Audio Mixer, Erin Rettig, in a mixing room on the Fox studios lot here in LA. If you've ever seen pictures of this kind of work being done, the film is projected up on a large screen, and the mixer uses a board with 10,000 knobs on it to tell a computer what to do with each and every bit of sound in the movie. We're pleased to tell you that Whisperer has never sounded better than it did while being played through this fantasically high-end audio system. We're making a couple of last minute adjustments and changes to the picture. One fun detail is that the camera we used on a few days of shooting had a dead pixel on the CCD. What that means is that each frame of the movie consists of exactly 2,073,600 pixels of information. And exactly one pixel in every frame shot on those days is dead. So we have to go back to every frame (and there's 23.97 frames in every second) and repair the dead pixel. This is why we are so glad there are powerful computers and great pieces of software to do this kind of thing. Now that completion of the movie is nigh, we'll be back in touch with our team of translators to do some final adjustments to the translations to ensure they match the picture. Production of the DVD and BluRay is next on the agenda. 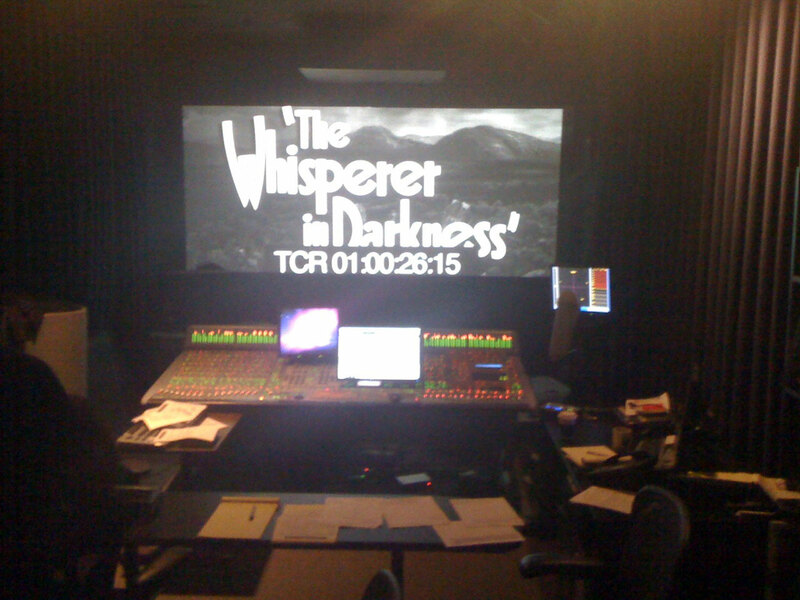 At last - 2011 - the year The Whisperer in Darkness finally comes out. At the moment, all that really remains is audio work. Troy is revising some of the sound cues and adding in a few we never had in the first place. Erin has all of the audio tracks and is working away on the final production mix. When we get the last of the audio files, we'll whisk them over to him. He'll mix those down and then output the final version of the audio. Yes, that remains the big question. 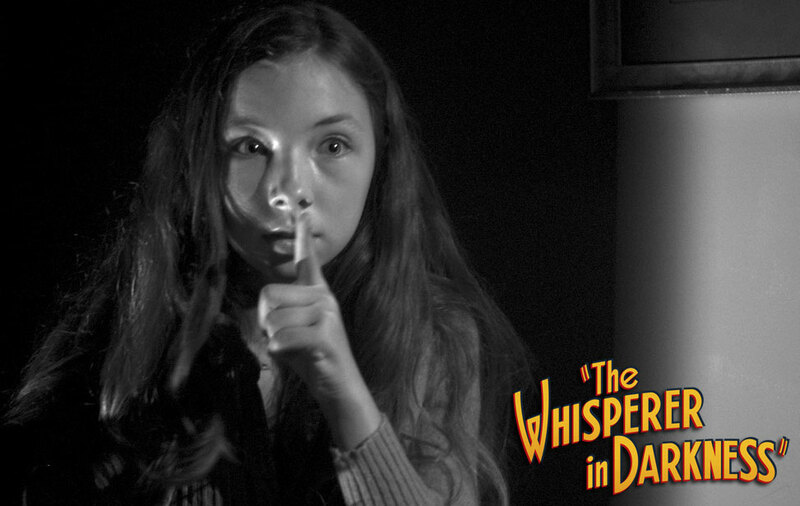 We submitted Whisperer to a few film festivals last fall and those are starting to come around. At the moment, TWID is slated to screen in March and April at SFF-Rated in Athens Greece, the Belfast Film Festival in Northern Ireland, the Imagine Film Festival in the Netherlands. There's a number of additional fests that we haven't heard back from, so we keep a watch on it day to day. We haven't yet scheduled a US premiere - which is not at all surprising as we don't yet have a final version of the movie - even the cast and crew haven't seen it yet. But we anticipate holding a screening for our gang in February. We have committed to screening it at the HP Lovecraft Film Festival. Historically, this festival has been held in Portland, Oregon. This year though, it's in San Pedro, California mid-September. As that's in the Los Angeles area, we're thinking we'll get as many of our team members involved as possible and make the event quite a Lovecraftian to-do! As the movie is finally completed, we'll begin work on prepping the DVD and BluRay version of the film for release later in the year. As we learned with The Call of Cthulhu, making a DVD is quite a labor intensive process. We'll edit the behind-the-scenes footage, shoot some interviews, design menus and dive in on all the prep that goes into making a DVD. We don't know when it will become commercially available, but it's unlikely that would be before this summer. The good news is that it's equally unlikely that it will be later than this summer. We'll keep you posted. And it's done. Really. Finished. What does that mean? It means the final audio has been completed, screeners have been made of the movie in its final form. It means tomorrow we'll be having a screening for the cast and crew. It mean's we're not reworking the content of the movie in a significant way. Now we're putting it on different media - we burned our first BluRay this week - and testing it on different audio and video systems. So far the results have been pleasing. The HD image holds up very well on BluRay, and the Dolby Surround Sound sounds great when you play a DVD or BluRay back in an environment with the right hardware. Now that we're done making the movie, we begin nursing it through the next phase of its life. We have begun screening at festivals and are working hard to line up additional screenings worldwide throughout the year. We're working on the other items that go on the DVD or BluRay in addition to the movie: special features and subtitled translations. And we're working on some poster designs to help promote the film. In March the movie finally had its public premiere at the SFF-Rated Film Festival in Athens, Greece. The folks there were incredibly hospitable and Whisperer screened at a pair of sold-out showings. The film was very well received and they even sent us home with their Audience Award for Best Director. We thank Alecos Papadopolous and his team for providing an outstanding premiere. Click for photo of a real Mythos sighting in Athens. April 1 we screened at the Belfast Int'l Film Festival in Northern Ireland (click for photo of venue). A good crowd turned out at Belfast's Waterfront Hall to see Whisperer along with AM1200 and Die Farbe - a new German adaptation of The Colour Out of Space. We had a lively Q&A following the screening - we offer our gratitude to Andy Thomas, the crew at the Waterfront and the rest of the Belfast FF team. Many translations of the film are now complete and the final translations then need to be matched up with timecoded subtitles that will match the actors performance. There are 904 subtitles in the movie. There's about 25 languages. There's a lot of work in managing subtitles, especially when we can't read Hungarian. In addition to the festivals where we've been screening, we've got more lined up across the globe. This weekend Whisperer will also screen at the Berkshire International Film Festival in Pittsfield, Massachusetts (Mi-Go country! ), and mid June we'll screen at the Southside Film Festival in Pennsylvania. Things turn international again in July with screenings at Fantasia in Montreál, Canada; Fantaspoa in Porto Alegre, Brazil; PiFan in Puchon, Korea; and RioFan in Rio de Janero, Brazil. We have more festivals later in the year in Warsaw, Reno, Buffalo, and of course the HP Lovecraft Film Festival. We anticipate adding more festivals to the lineup; most of them dont notify films until roughly 8 weeks before the festival, so if you're wondering if we're coming to your neighborhood, our answer at the moment is we really don't know. Beyond festival life though, we continue to work on the assets for the DVD. Prepping a DVD is actually a pretty involved process. For the special features, we have to find, digitize and organize all of our Behind the Scenes footage and photos (and there are several thousand photographs from the making of this film). The we have to to schedule interviews, shoot them and edit the whole mess in an effort to make something that should be fun to watch. So we're working on that. The DVD also has its many languages. The HPLHS Volunteer Translator Corps has done a great job of rendering the final text of the film into a translation. We then take that translation and break it into timecoded phrases which we then synchronize to the actors' performances. As some sentences require many more words when translated (I'm talking to you, Finnish), each language is a sort of a jigsaw puzzle with 1,100 or so pieces. We are getting there though. Onward, ever onward. Whisperer finally had its US Premiere at the Seattle Int'l Film Festival. David Robertson, Andrew Leman and Sean Branney were there and had a great time at the festival. The crowds were big and enthusiastic and the SIFF team did a great job organizing the event. We followed the SIFF screening others in Massachusetts and Pennsylvania. July has several more and we continue to line up screenings all over the world for the rest of the year.